Today I have the honor to welcome you at the 22nd Meeting of the Plants’ Committee and to say how grateful we are to have an opportunity to host you and this very important meeting in Georgia. As you may know, Georgia is distinguished with its biological diversity as at national, as at regional and global level. The Caucasus region – including Georgia – has been recognized by the WWF as holding an important reservoir of biodiversity, and is considered a globally significant ‘biodiversity hotspot’ based on the richness of species, and level of endemism. As a consequence of its location and its physical and climatic diversity, Georgia has a remarkably rich and diverse flora in comparison to other temperate zone countries. We can mention over 6 000 species of vascular plants recorded in the Caucasus regions, while Georgia contains more than 4 000 of them. More than 100 species of mammals can be found here and some of them are endemic for the Caucasus region. Such a big natural capital obliges us to be highly responsible for rational use of it, and I can state that Georgia spares no efforts in this field. Georgia became a Party to the CITES in 1996. Since that Georgia is devoted to the main principles of the Convention, as we can clearly see actual consequences and threats caused by uncontrolled use of natural resources from one hand, and from the other hand, we clearly see the effectiveness (effective work) of the CITES. 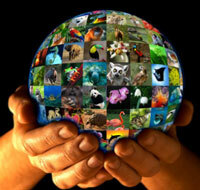 We can list a number of reasons why the CITES conferences and meetings are so important in the international calendar. The Convention’s work replenishes enthusiasm and gives hope, because it is practical and efficient, and it has direct connections to the biodiversity, as well as to the country’s economy and population wellbeing. It’s loyalty to the scientifically proved data in decision making from one hand, and continuous effort to involve as many stakeholders as possible, from the other, strengthen the Convention and strengthen the respect and believe in it. It happened so, that Georgia for the time being is involved more actively in the plants related issues. The way towards the implementation of the Convention provisions was not easy for Georgia, though I have to mention some success as well, that would not be reached without mutual cooperation and reasonable decisions made jointly. For instance, international trade with one of the CITES species, namely Snowdrop, encountered certain difficulties because of lack of scientifically proved data on its conservation status in Georgia. The Georgian Management Authorities of CITES, the Convention Secretariat, Kew Botanical Garden and the Government of Netherlands applied joint efforts and developed proper management plan for that species. Besides a number of different programs implemented at national level in Georgia, we confirm our interest and readiness for active cooperation at international level. I would like to mention, for instance, the General Assembly of the United Nations where Georgia was among the co-sponsors, who submitted the Draft Resolution on Illicit Trafficking in Wildlife. We would like to express our gratitude to the German International Cooperation Society for the continuous support and cooperation in implementation of the Convention in general, and in organizing this meeting, in particular. Herewith, I would like to take an opportunity and express our appreciation to the Convention Secretariat and to Mr. Scanlon personally, for constant assistance and such successful cooperation. I would like to stress that we’ve constantly perceived the will and readiness for cooperation. We believe that interests of all stakeholders will be taken into consideration while decision making on any relevant issue and, that our common goal to avoid threat to natural populations will be reached. I would like to express our special thanks to Madam Margarita Clemente for her kind support and contribution in implementation of the Convention in Georgia. We can perceive her assistance at each stage of our activities in this field. I have the pleasure on behalf of the Government of Georgia to invite you to the Reception organized tonight in your honor. I believe that your hard work during next several days will be remunerated and this meeting will be crowned with success. I would like to thank each of you in advance for that. This meeting has a special importance because of one more reason – it is the last meeting before the Conference of the Parties and its results will be reflected on the Conference of the Parties as well. I do hope that you feel comfortable as within the working area, as when you have free time in the evenings and enjoy each day spent in Georgia.